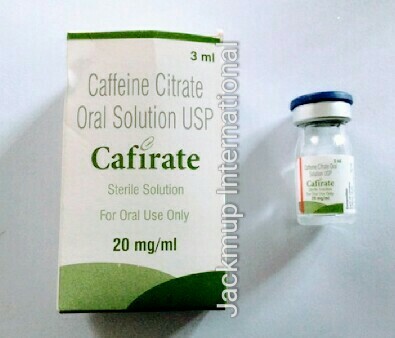 Description:- Cafirate 20 mg solution is used in the treatment of migraine.Migraine headaches are thought to result from the dilatation of blood vessels in the head. Cafirate 20 mg solution works by constricting (narrowing) these blood vessels, thus relieving the migraine headache. For relief of pain, consume the medicine only at recommended doses. Immediately consult doctor in case you take more than the prescribed/ recommended dose even if you feel well. Also consult the doctor if the symptoms last for more than 3 days despite taking the medicine. Preparations of caffeine and ergot derivatives have been discontinued in view of patient safety. When caffeine citrate solution is used for premature apnea of newborns, remember to use one vial of the drug for one dose. Throw away the left-over solution after required amount is used. Side Effects:- Insomnia (difficulty in sleeping), Dehydration.